Feb 19 2012. The International Space Station (ISS) 1845hrs pass over UK skies. 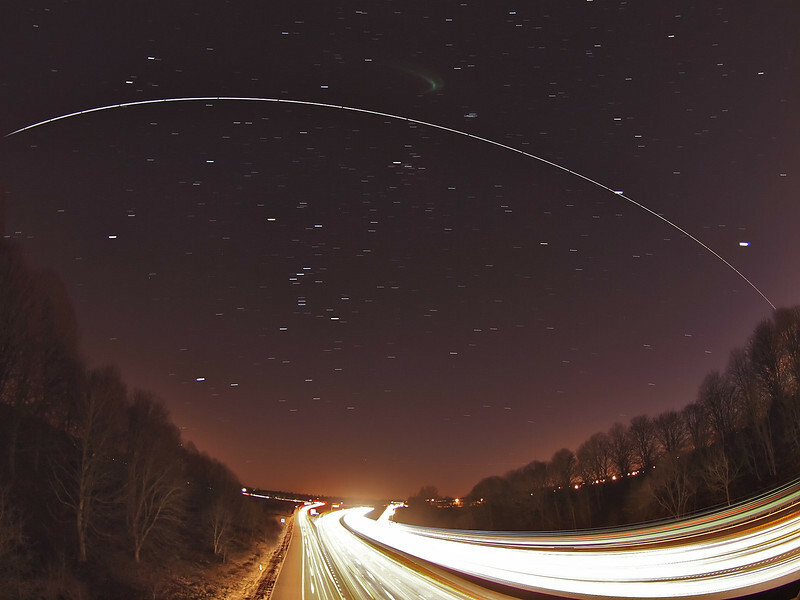 The super bright ISS travelling at 17,500mph flies over the more sedate 70mph motorway traffic at Lutterworth, Leics. The ISS started in the west (right) passed the first bright planet Venus (bottom right) and then almost crossed straight through Jupiter (next bright up) as it made its way east (left) and above the Orion constellation. To capture this photo I was perched on top of a motorway bridge and placed camera on tripod shooting a succession of 10s exposures. The final composite contains approx 25 images and stacked using StarStax software. Captured with Olympus E5, 8mm fisheye, F4, 10s, ISO 500.